Up high on Mt. Kailash while Shiva sat lost in meditation, Parvati his wife was getting lonely. She had Shiva’s subjects for company and his faithful attendant Nandi took good care of her. Yet, Parvati longed for someone to call her own. She longed for a child. Once when she was bathing, scrubbing sandalwood paste on her body, Parvati decided to make herself a child. She mixed the scrapings from her body with the clay from the river and lovingly created a young boy with it. He was so fair and beautiful that she breathed life into him. Many months passed and one day while Parvati was in her cave and Ganesha stood outside guarding the entrance, Shiva returned home. 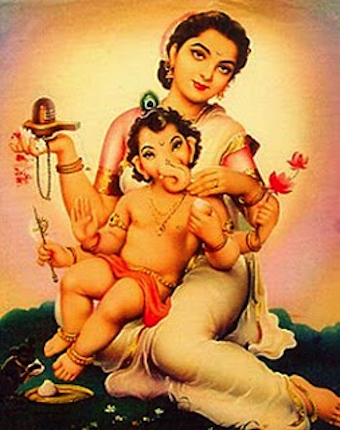 Ganesha had strict instruction from his mother to not let anyone in, so he forbade Shiva from entering the cave. Furious at being stopped from going into his own home and unaware that the young boy was Parvati’s son, Shiva in a fit of temper cut the boy’s head off. When Parvati came out and saw what had happened she was overcome with grief and rage. She summoned all the goddesses to avenge the death of her son. A terrible war ensued and Shiva soon realized his mistake. He tried to calm Parvati down but she demanded he bring her son back to life. Now Shiva didn’t know what to do so he approached Brahma, the Creator, for help. Brahma suggested they get the head of the first animal they find which is lying down facing North. Shiva’s servants went into the forest looking for such an animal and returned with an elephant’s head. Shiva then placed the head on Ganesha’s lifeless body and resurrected him. Parvati was overjoyed but soon her heart sank at her son’s plight. “What kind of life will my son have stuck with an elephant’s head?” she asked Shiva. Shiva promised Parvati that their son would be called Ganapati, Lord of all beings. Loved and adored by all, he would be worshiped first, before any other god. And so we’ve come to love and adore this playful, clever little potbellied boy, darling of his parents and guardian of all beings. He is the remover of all obstacles. We chant his name before any auspicious work is begun and before any kind of worship. To him we pray for peace and harmony. Historically however, it was only around the fourth or the fifth century that Ganesha rose in prominence. It was during the reign of the Gupta dynasty when Hindu traditions shifted towards Brahmanism that Ganesha was established as one of the five prime deities. Nonetheless, he is today one of Hinduism’s most favourite gods. He has truly become Lord of the People. I wonder if the rather charming anecdotes of Ganesha’s life have been largely responsible for his popularity. Or, is it because humans have a strange affinity towards elephants? We love elephants because they are so much like us. Or perhaps we just like someone who is not so perfect but wears his imperfections so well. Well, whatever it is, no Hindu home or life is complete without Ganesha in it. Ganesha’s is also worshipped as the remover of obstacles by Jains and Buddhists. As Hinduism gradually spread to south east Asia so did the worship and iconography of Ganesha. Modified forms of Ganesha continue to be worshipped in Nepal, Sri Lanka, Tibet, Burma Thailand, Combodia and in some Buddhist sects of China and Japan where he is known as Kangiten. 5th century “image of Ganesha, consecrated by the Shahi King Khingala.” found at Garddez, Afghanistan. I look forward to exploring some of the symbolism behind Ganesha’s birth and form in my next post. The circumambulation(parikrama) is done usaluly in a clockwise direction except in the Shiva temples. The clockwise direction is followed since the devotees should have their rightside towards the object of worship. For this, the devotees will have to walk towards their lefthand side from the front of the object of worship. Pradakshina literally means: to the right (Dakshina means right). So in Pradakshina, one goes to the left hand direction to keep the deity on one’s right side.Folks who cannot walk around the temple (for accessibility problems, crowds or other reasons) often perform “auto-pradakshina” by going around themselves — this is like glorifying the God within oneself. Thank you for this information. I have only just discovered all the comments!